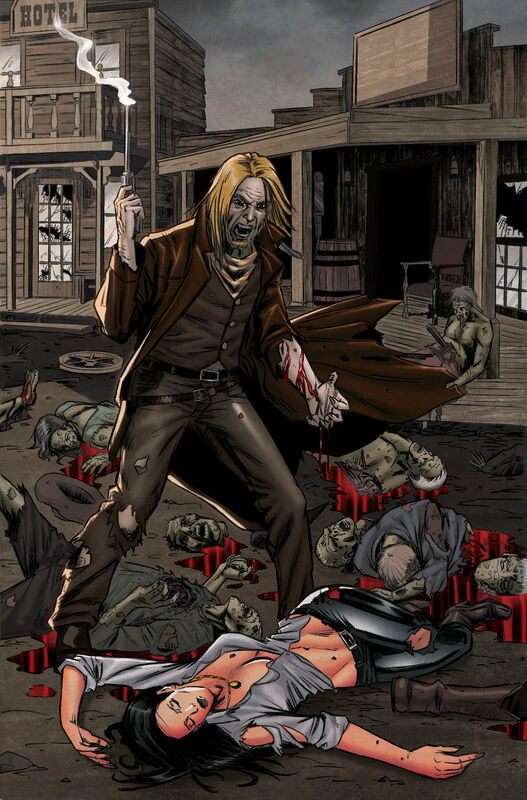 Day breaks on Brimstone and corpses of the damned foul the street but now the poisonous curse is working its way through Victor’s veins, turning the most deadly gunslinger in the West into an even faster, heartless supernatural killer. As the lines of good and evil begin to blur, Victor has only one shot at saving his friends. Trouble comes knocking on Paige’s front door when a mysterious fire nearly burns down her house. The nature of the attack suggests a firestarter, but the real answer might not be that simple. 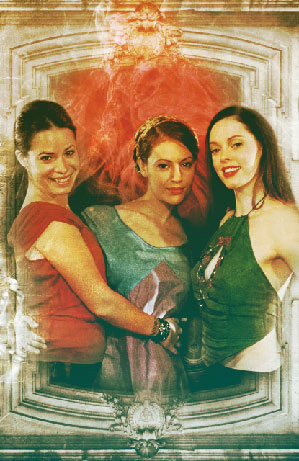 Are The Charmed Ones about to face another threat from the past or is the culprit a more recent addition to their lives? A secret that Piper’s been keeping might hold the answer to more than just Paige’s question or it could lead to a whole new set of problems instead. “Edgy and twisted. 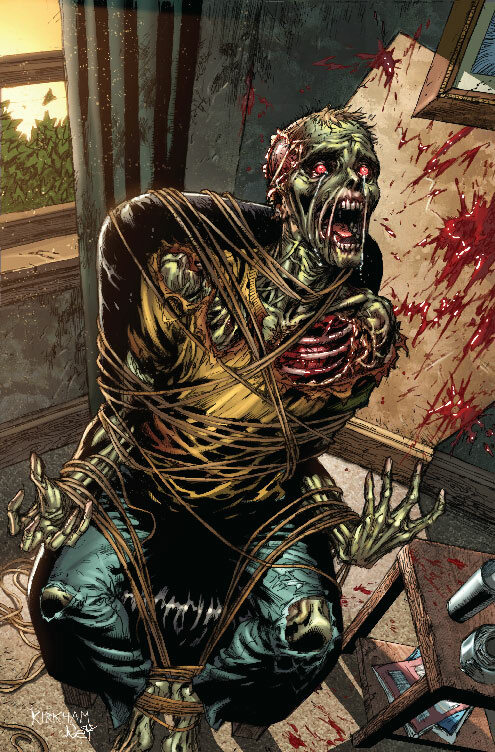 Doesn’t reset the superhero paradigm so much as kick it, mercilessly, off the ledge.” – Newsarama. After years of running from his past Eddie must finally confront the monster of his own making and will be forced to make a choice that will change his life forever! 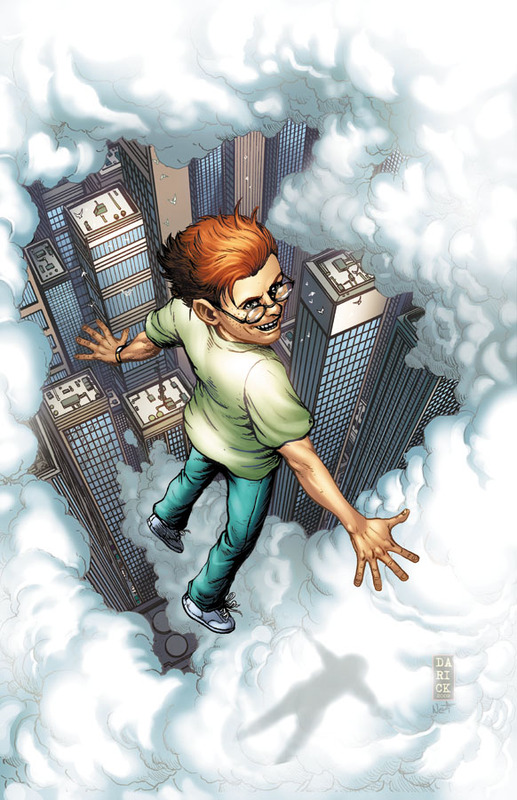 Set in a world where the super heroes aren’t really heroes at all…How far would you go to Fly? 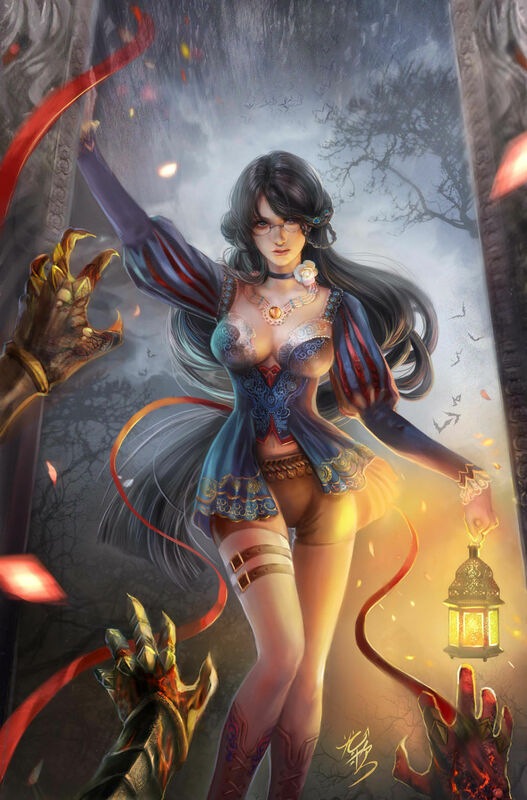 It’s the most wonderful time of the year…for Zenescope and Grimm Fairy Tales there’s no better holiday than Halloween. Our annual tradition continues with our Halloween special that features three all new blood curdling short stories that spotlight your favorite characters from the Grimm Universe. After the events of the Dream Eater crossover Sela is finally able to resume her quest to free Erik’s soul…a quest that will take her straight into the heart of Limbo. But the gates of Limbo do not easily open for outsiders and those that enter the realm seldom come back. With the powerful three headed dragon Azhi Dahaka under her spell the evil witch Acacia prepares to unleash hell on Bagdhad and only Sinbad, Baba Yaga and Belinda stand in her way. 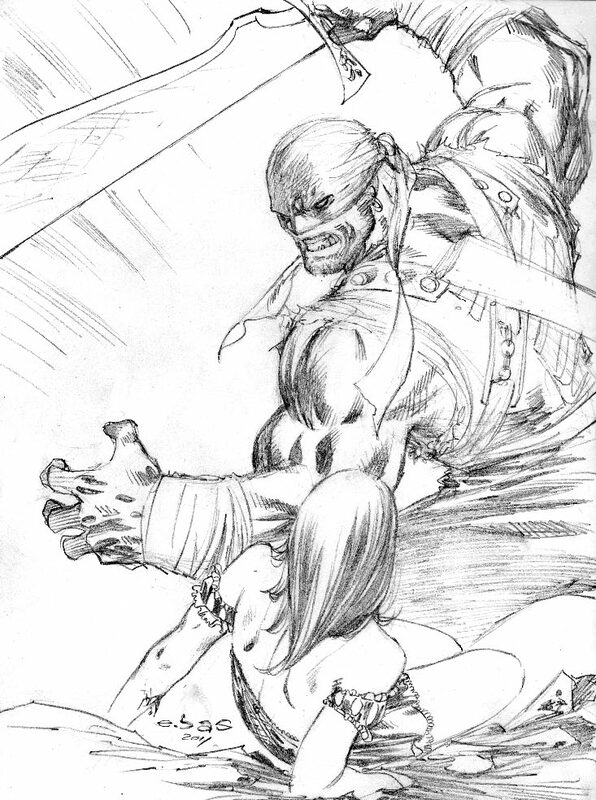 Don’t miss the conclusion to this mini Grimm Fairy Tales/Sinbad crossover. Erica’s power is unleashed and the only thing standing in the way of her rage and the destruction of those she hates most is Samantha, guardian of Earth. 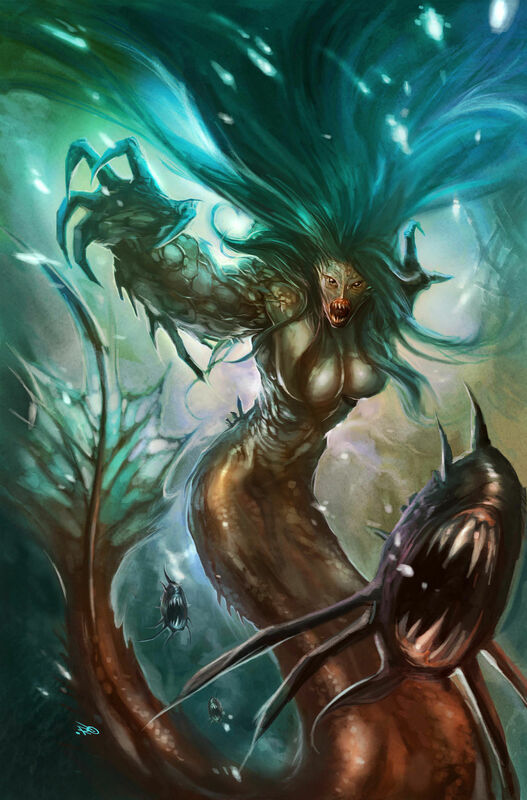 Meanwhile the Sea Witch waits and watches for the final outcome of the battle as she has plans of her own. As Anna falls mysteriously ill, Braden must search out help in the form of a voodoo priestess who might have power of her own to combat the evil tormenting the town. 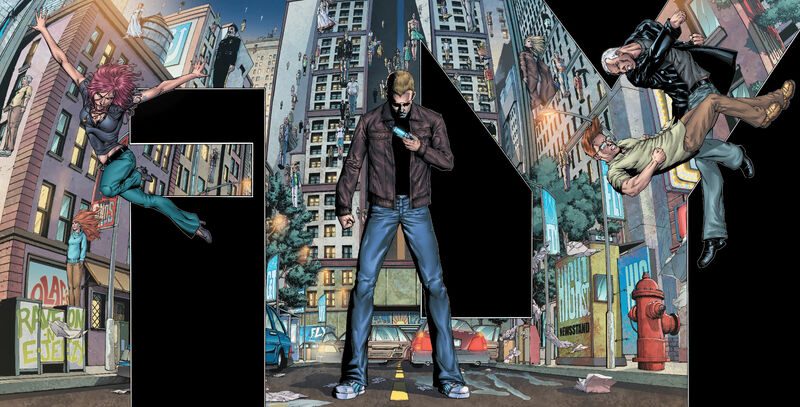 The series the Philadelphia Daily News called one of the years best of 2009 is back with a brand new story arc that will hook you right in! family he never met, she tries to help by researching his past unaware that a mysterious force works against her. As she tries to orchestrate a reunion centuries in the making, she could wind up tearing a family apart. 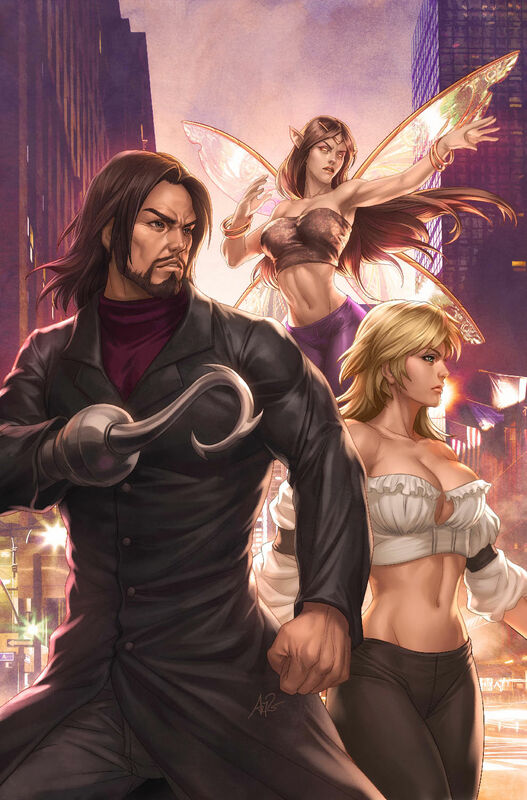 Philadelphia, PA, May 2, 2011– Zenescope Entertainment has announced plans to release a new Grimm Fairy Tales spinoff series geared toward all-ages readers. 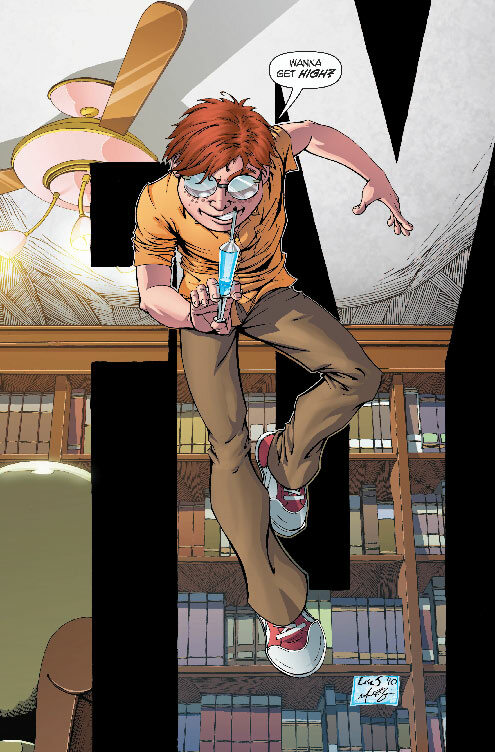 The new five issue mini-series entitled The Library is being penned by Joe Brusha, writer of hit series Grimm Fairy Tales and Neverland, with the first issue scheduled to hit shelves in July of this year. 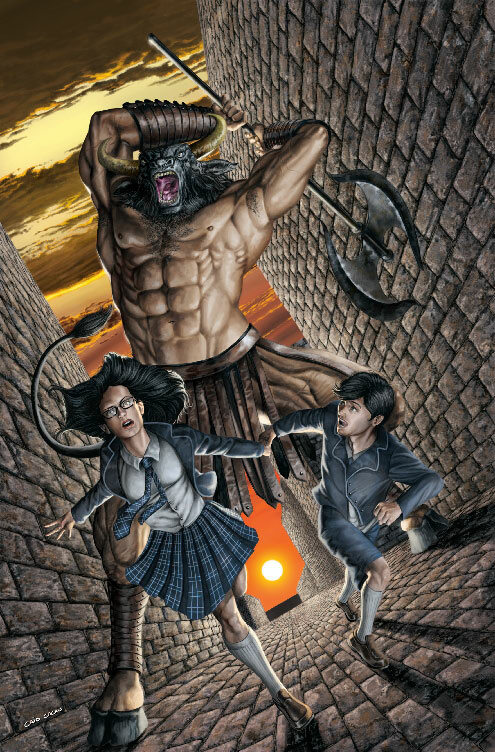 Grimm Fairy Tales’ The Library will be exploring an alternate reality of Zenescope’s Grimm Fairy Tales Universe and follows a teenage Sela Mathers as she and her younger brother discover an ancient and magical book inside a condemned library. The book unleashes a powerful spell as the two accidentally unlock characters and worlds from the other books within the Library. 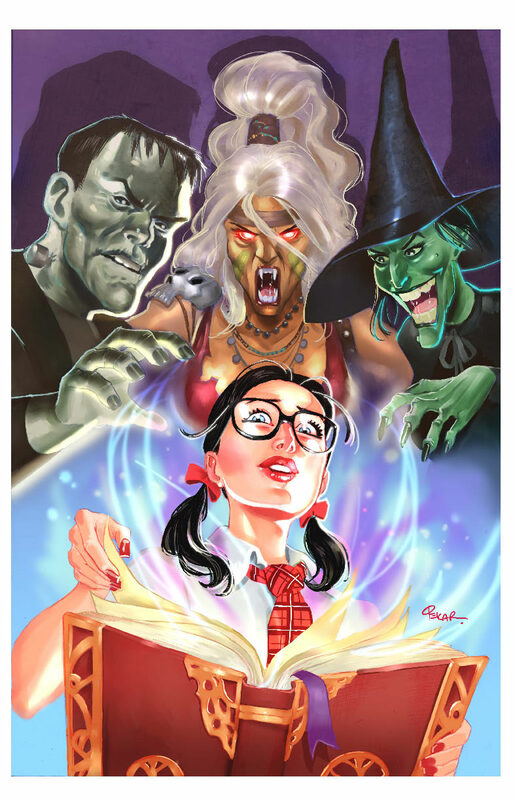 Both heroes and villains such as Hercules, Frankenstein and the Wicked Witch of the East, are soon unleashed and the two kids find themselves in a race against time to reverse the spell before the villains can wreak havoc on Earth. of the camp warns that the must all get out of town now or die. 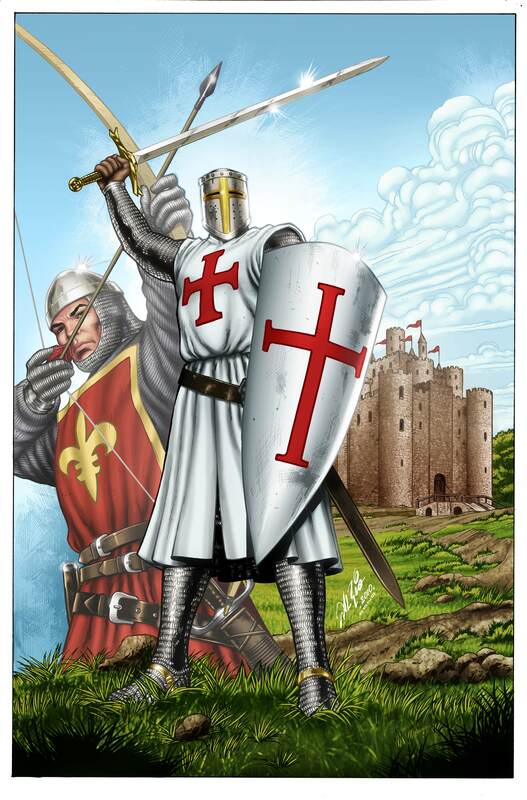 But the hardened mercenaries have their eyes set on mountains of gold and won’t be easily swayed. But something awaits them in the shadows and it hungers for their flesh. 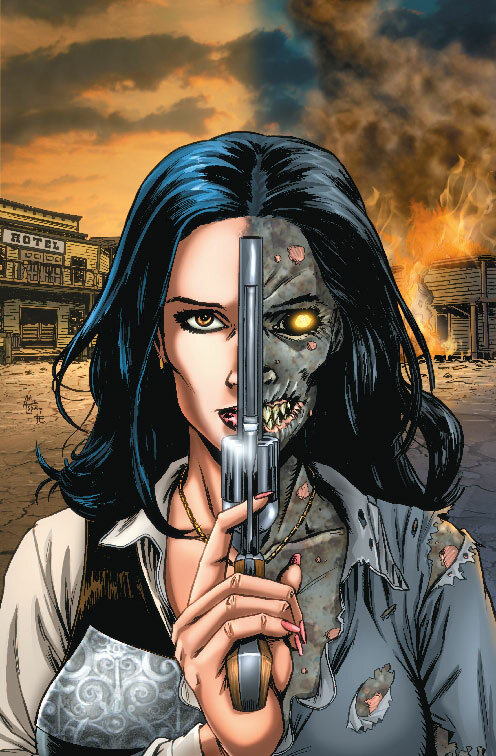 28 Days Later meets Tombstone in this wild supernatural action series from Zenescope! For over 165 million years dinosaurs ruled the earth….until the alien overlord Zalex discovered the planet 100 million years ago. In search of an army to conquer the universe Zalex finds the perfect candidates to mutate into his ultimate soldiers in earth’s Jurassic reptiles. 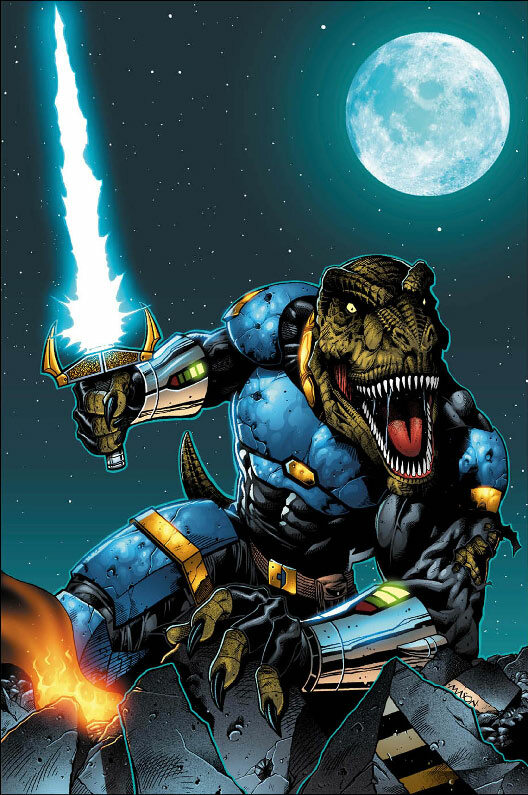 With his new army nothing can stop Zalex from ruling the galaxy and the universe beyond it…..nothing but a team of mutated dinosaur heroes. Don’t miss this exciting prequel issue featuring what’s sure to be the hottest team of mutated reptiles to grace the four color world in three decades. 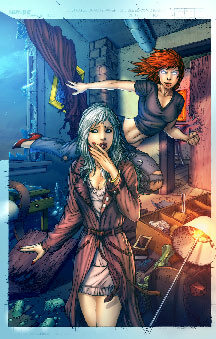 The first original title in Zenescope Entertainment’s new Silver Dragon Books line. As a teenager Eddie Patron had thought he’d seen it all. That is until his nerdy friend Francis Keiser introduced him to the drug FLY. Now the sky’s the limit and Eddie is about to be introduced to a whole new world. A world that is not without its consequences. 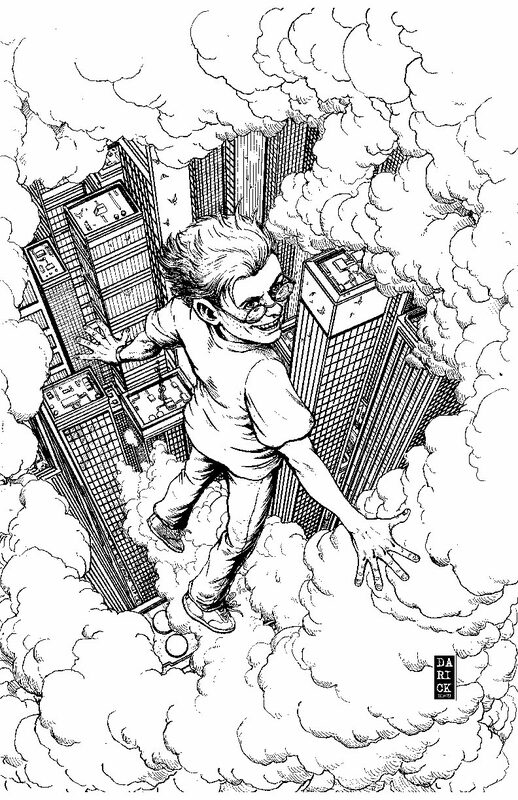 From the mind of the writer of Image Comics THE GIFT, Zenescopes WONDERLAND TRILOGY and THE WAKING comes Raven Gregory’s latest tale of suspense set in a world where superheroes aren’t really heroes at all… How far would you go to FLY? 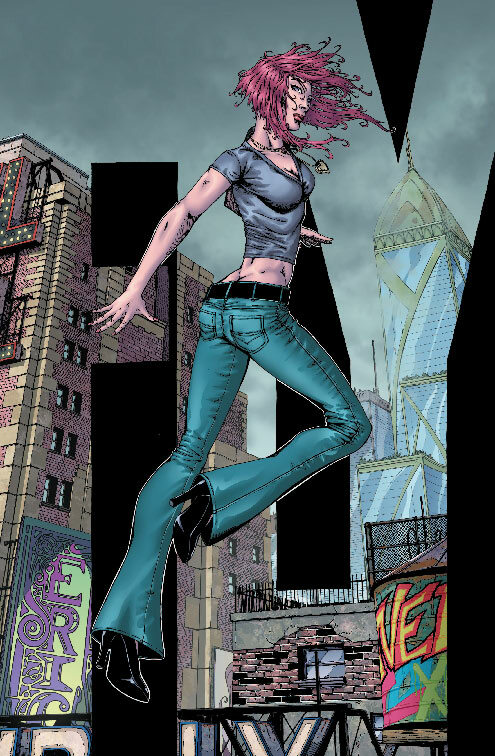 Featuring 4 covers by superstar artists Amanda Conner (Supergirl, The Pro), Darick Robertson (The Boys), Eric J (JSA, Rex Mundi), and Ale Garza (Fathom, Superman/Batman). 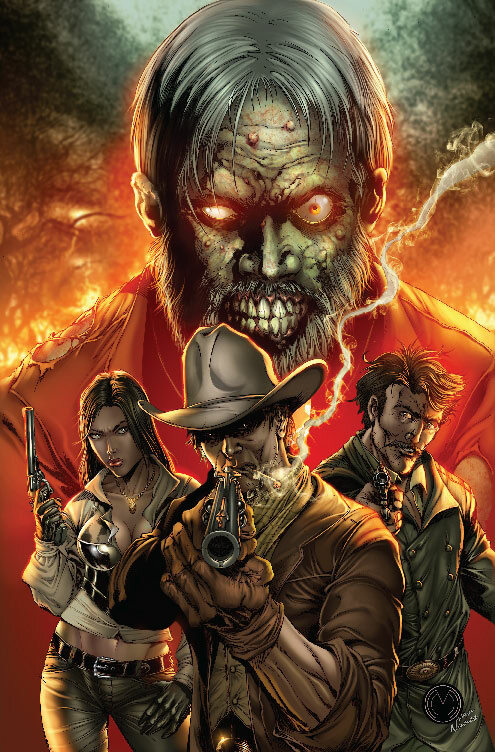 As an added bonus retailers who order 20 copies of A, B, C, or D will receive a Darick Robertson sketch cover free. Don’t miss the series that critics are raving about! The hit series you’ve followed for over 5 years continues as danger continues to escalate! The city of Tallus has been destroyed and Sela and her companions lay beneath the body of the slain Shadow Dragon….whether alive or dead remains to be seen. Even if they have survived they still have Orcus to contend with. Don’t miss the exciting conclusion to the Mother Nature story arc! 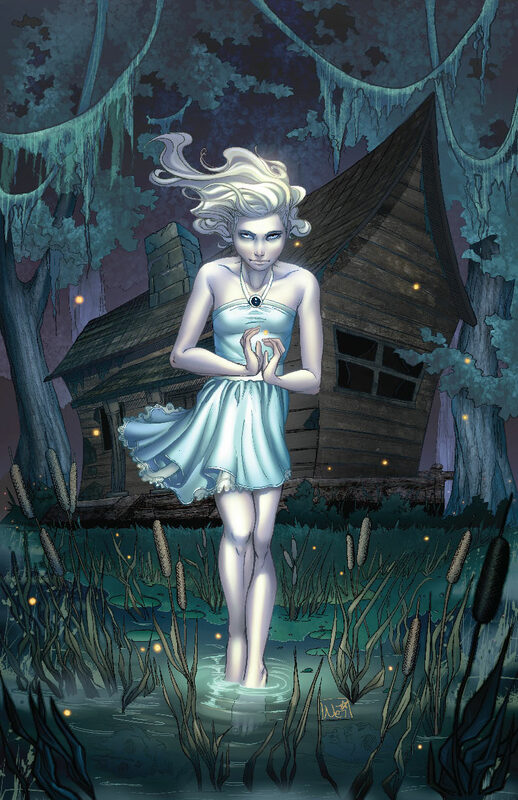 Sela’s journey to free Erik’s soul from limbo leads her to search out the deadly Sea Witch named Ursula who dwells beneath the ocean in the realm of Myst. But Sela isn’t the only one looking for the powerful witch; Belinda has too returned to Myst and the fate of the Grimm Universe hangs in the balance as two arch enemies meet once again. Part 9 of the event that will change everything is here! and characters from the books and novels around them. 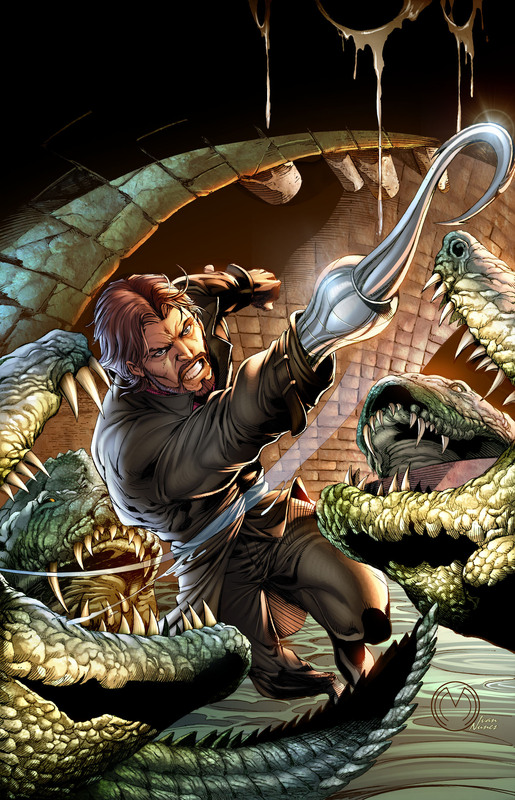 Hercules, Robin Hood and Pecos Bill all come magically to life. But heroes aren’t the only characters in stories. Villains too are affected by the magic and soon the children find themselves in a race against time to reverse the spell as evil characters from all of literature threaten to take over the world. Their only chance lies with the heroes they’ve brought to life. But even that may not be enough to stop Frankenstein, Baba Yaga, the Wicked Witch of the West and many more! The amazing Dream Eater crossover event continues! 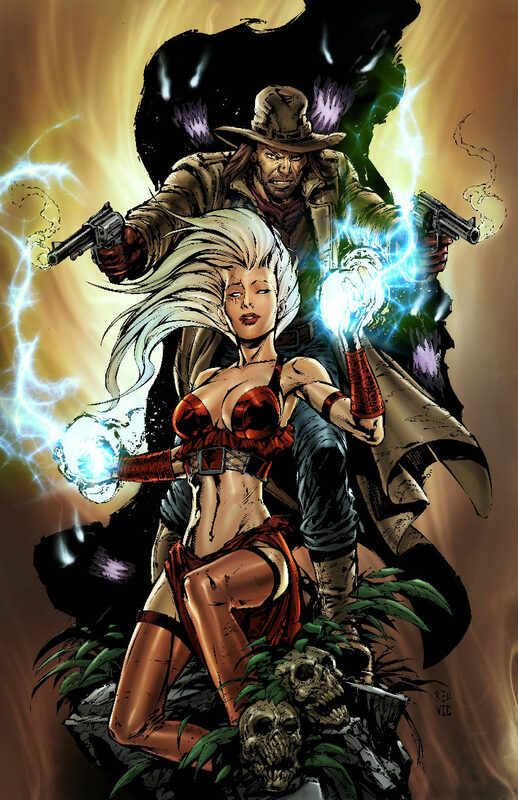 Evil and good team up as Baba Yaga and Samantha go in search of the one weapon that might give them a chance at defeating the Dream Eater. But not only is the weapon in a different dimension, it’s in a different time and letting there will only be half the battle. The Dream Eater is coming for everyone and there is little time to stop him. 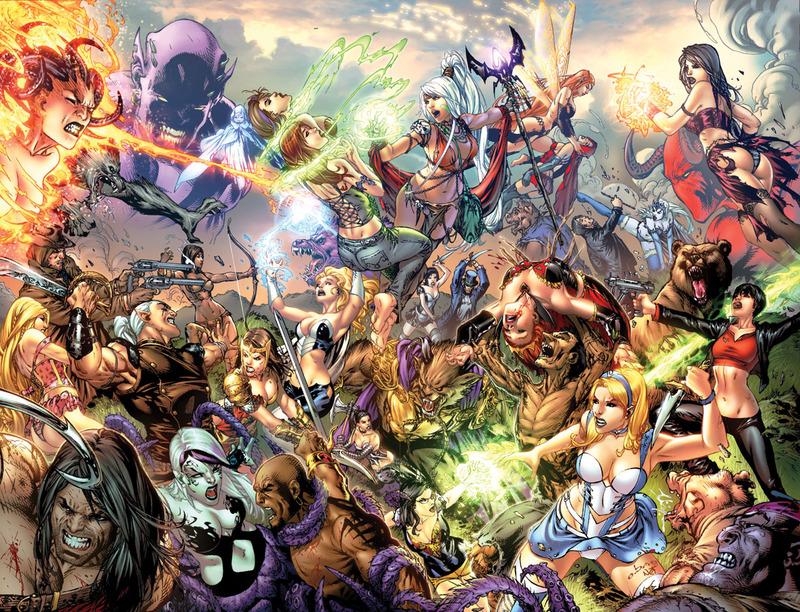 Don’t miss part 7 of the incredible Grimm Fairy Tales crossover event! The amazing Dream Eater crossover event continues! 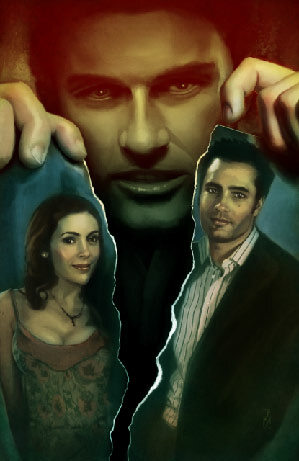 Braden and Anna investigate a mysterious occurrence in a small Delaware town as residents are ravaged by a sickness that turns them old and kills them within hours. Only a few are not affected and Anna knows that something evil is at work. 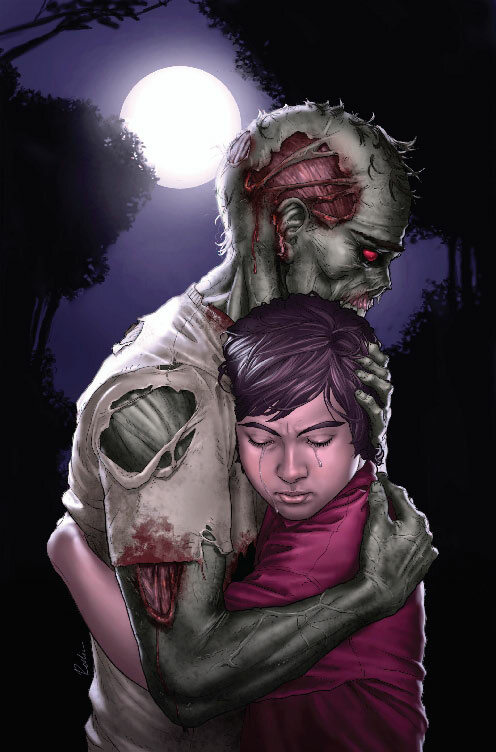 Now as Braden becomes infected, Anna must figure out a way to save him before he too falls victim! 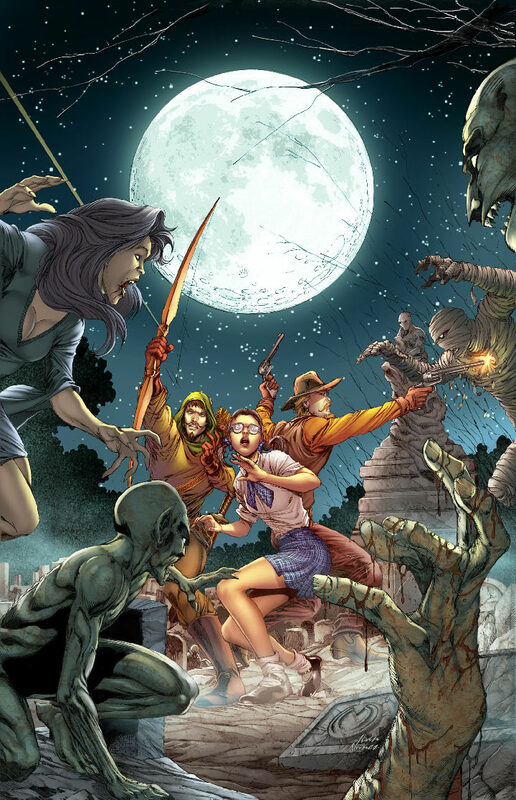 Part 6 of the incredible Grimm Fairy Tales Dream Eater crossover event is here and includes 40 pages of content! The series that the Philadelphia Daily News called “one of the year’s best” of 2009 returns!! What at first seemed like a simple haunting has quickly turned into a nightmare. A spirit has been unleashed and its power has been growing stronger ever since. Now Anna’s visions will lead her and Braden to Philadelphia to investigate the nightmarish occurrences and a possessed boy might prove to be just the beginning of the horror that awaits the duo. FEATURING a cover by superstar artist ARTGERM (Batman, Birds of Prey, Batgirl) For every 20 copies of cover A or cover B retailers purchase, they will receive one FREE copy Mike Debalfo’s San Diego Comic Con Exclusive limited to only 500 copies! The amazing Dream Eater crossover event continues! Sinbad and his crew come face to face with Baba Yaga as she enters their realm to find the mysterious weapon that might be able to stop the Dream Eater. What is this powerful weapon and what tragic ties does it have to one of the most evil villains the Grimm Universe has ever seen? Part 8 of the incredible Grimm Fairy Tales Dream Eater crossover event is here and includes 40 pages of content! When Calie left the Liddle home she had no idea of the terrible legacy she was leaving behind. A house possessed by the evil of Wonderland has been taking the lives of anyone foolish enough to enter. Innocent or not, each victim has fallen in terrifying manners and once you enter, there is no escape from its wrath! 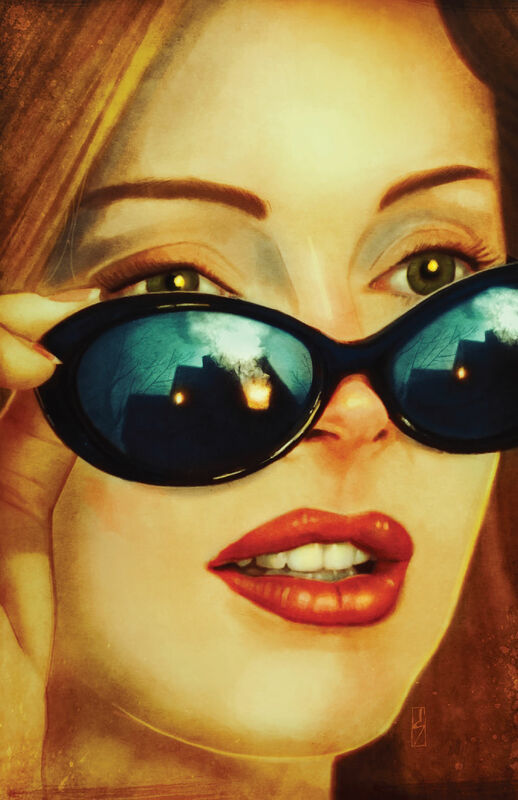 Three Wonderland Annuals are now collected into one stunning trade paperback. If walls could speak, these would scream.